How y’all doing, forex buddies? If you want to pillage some quick pips from the Loonie and you’re on the lookout for a post-BOC catalyst, then heads up because Canada’s August jobs report will be released this Friday (September 8, 12:30 pm GMT). And as usual, I’m serving up another Event Preview to help y’all get up to speed on what happened last time and what’s to be expected this time, as well as provide y’all with some general tips. If you can still remember last month’s Event Preview for Canada’s July jobs report, I mentioned back then that the available leading indicators were limited. 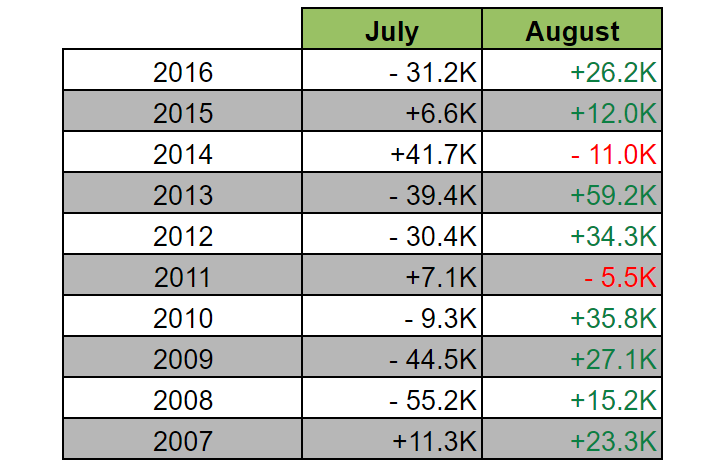 However, I also pointed out that jobs growth in July tend to be slower compared to June. Moreover, I also pointed out that economists have a strong tendency to overshoot their estimates, resulting in more downside surprises. As such, I concluded that chance seems to be skewed more towards a possible downside surprise for jobs growth. 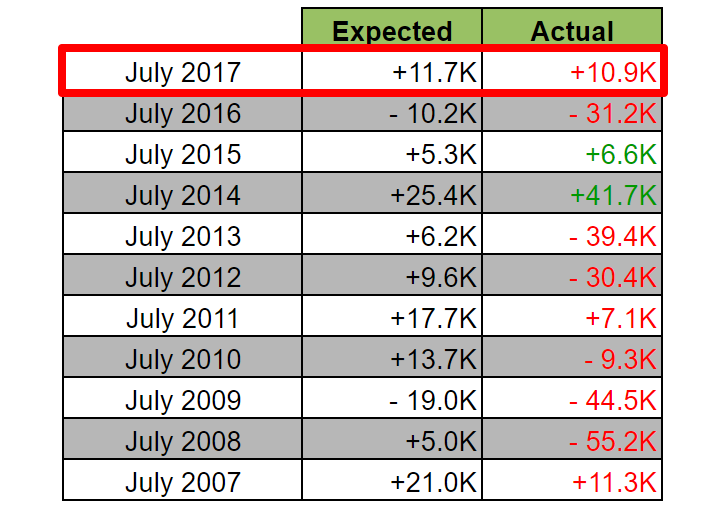 And, well, jobs growth in July was slower compared to June and we also got a downside surprise to boot, since the Canadian economy only generated +10.9K jobs in July (+11.7K expected, +45.3K previous). Looking at the details of the jobs report, the weak jobs growth in July was apparently because the 35.1K increase in full-time jobs was partially offset by the loss of 24.3K part-time jobs. As for the other labor market indicators, the jobless rate dropped from 6.5% to 6.3% partially because the labor force participation rate fell from 65.9% to 65.7%. The fall in the jobless rate is still somewhat healthy, though, since net employment did grow and the number of unemployed people fell from 1,270K to 1,247K. As for wage growth, it was mixed since average hourly earnings fell by 0.35% month-on-month but ticked higher to 1.30% year-on-year, which is the fastest annual increase in five months after wage growth bottomed out at 0.66% back in April. To summarize, Canada’s July jobs report looked bad on the surface, which is why the initial knee-jerk reaction was to dump the Loonie. Overall, however, Canada’s July jobs report was actually mixed, which is likely why Loonie bulls charged back in a few minutes later. Loonie bulls and Loonie bears then continued fighting it out, and so the Loonie’s price action became mixed and choppy later. Well, except on USD/CAD where the Loonie was clearly losing out, but that was due to strong demand for USD at the time because of the better-than-expected July NFP report. For the employment situation in August, there isn’t really a consensus for net employment change, although forecasts generally fall between the +15.0K to +19.0K range. Regardless of precise forecasts numbers, the general forecast range of +15.0K to +19.0K is a stronger increase compared to July’s +10.9K. 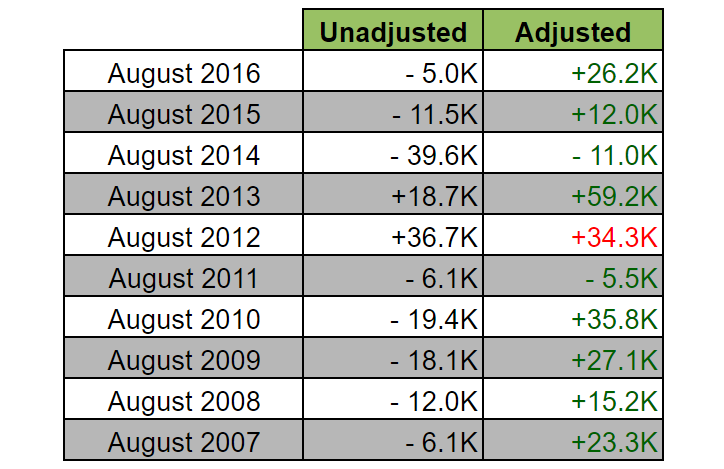 As such, there is an implied consensus that jobs growth in August picked up the pace. Also, there is a consensus that Canada’s jobless rate would hold steady at 6.3% while the participation rate is expected to hold steady at 65.7%. Okay, so what do the leading indicators have to say? Well, the comprehensive Ivey PMI isn’t out yet, so were in a disadvantage here. But we do have the August manufacturing PMI reading from RBC-Markit. And unfortunately, that weakened from 55.5 to 54.6. As for historical tendencies, Canada usually sheds jobs during the August period. But because of seasonal adjustments, the actual adjusted reading is almost always better than the unadjusted reading. Also, the adjusted reading is usually a positive number. However, economists are apparently a pessimistic lot since they have a rather strong tendency to undershoot their guesstimates, resulting in far more upside surprises. Another major historical tendency is that the seasonally-adjusted reading for jobs growth in August also tends to be stronger compared to July. In summary, we’re driving a bit blind here because the Ivey PMI report isn’t out yet. However, historical tendencies do support forecasts that jobs growth in August picked up the pace. In addition, historical tendencies also skew probability in favor of a likely upside surprise, since economists have a rather strong tendency to undershoot their guesstimates, likely because the unadjusted numbers tend to be negative. Anyhow, keep in mind that traders are usually focused on the net change in employment. So if that meets or beats the forecast range of 15.0K to 19.0K, then the Loonie usually reacts positively. On the flip side, a miss generally triggers a Loonie selloff. Also note that Canadian economic reports are usually only good for “pillaging” quick pips from the Loonie since oil prices tend to dictate follow-through buying and selling. And you can check real-time prices of oil futures here and here. However, since the BOC just hiked recently, forex traders will likely use the upcoming jobs report to validate the BOC’s rate hike, so there’s a good chance for follow-through buying if the jobs report exceeds expectations, or follow-through selling if expectations aren’t met.